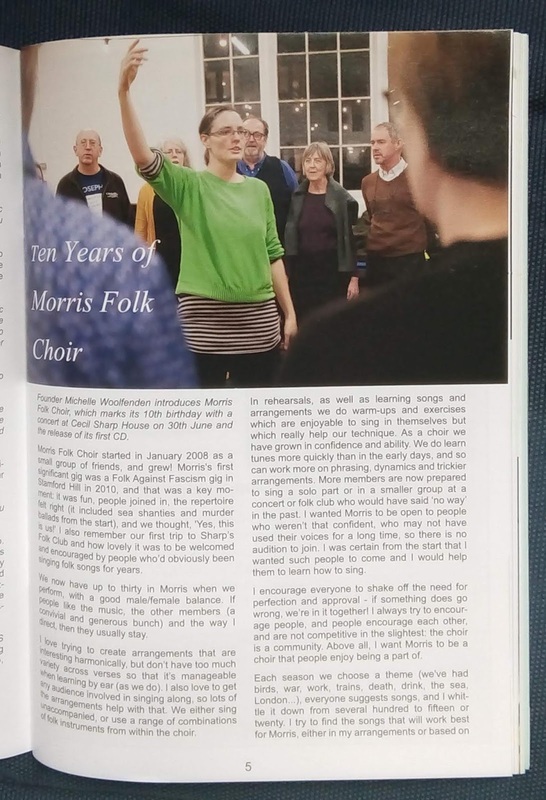 Founder Michelle Woolfenden introduces Morris Folk Choir, which marks its 10th birthday with a concert at Cecil Sharp House on 30th June and the release of its first CD. Morris Folk Choir started in January 2008 as a small group of friends, and grew! 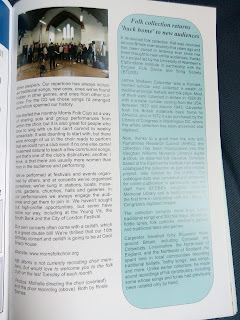 Word of mouth was the main source of new members in the early years; more recently people also find us online or having seen us perform. We now have up to thirty in Morris when we perform, with a good male/female balance. We are at a good size: would lose some of the folk sound if we got any bigger. Morris's first public performance was at lslington Folk Club, where we did Matty Groves and The Bad Squire. I always had in mind that we would be a performing choir - it motivates you to learn the songs really well, and gives a sense of completion. 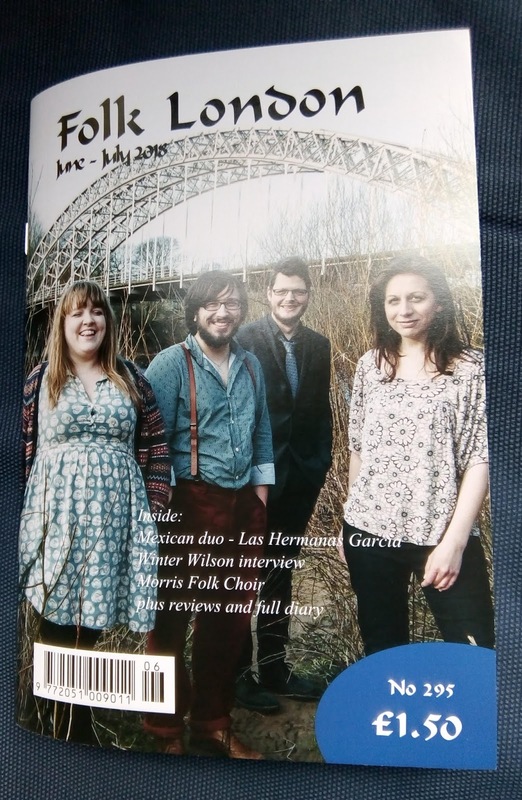 I also remember our first trip to Sharp’s Folk Club and how lovely it was to be welcomed and encouraged by people who’d obviously been singing folk songs for years. If people like the music, the other members (a convivial and generous bunch) and the way I direct, then they usually stay. I love trying to create arrangements that are interesting harmonically, but don’t have too much variety across verses so that it’s manageable when learning by ear (as we do). I also love to get any audience involved in singing along, so lots of the arrangements help with that. We either sing unaccompanied or use a range of combinations of folk instruments from within the choir - including guitar, fiddle, banjo, concertina, mouth organ, recorder and whistle. In some cases people have learnt or gone back to an instrument because of being in the choir, which is great. In rehearsals, as well as learning songs and arrangements we do warm-ups and exercises which are enjoyable to sing in themselves but which really help our technique. It’s amazing to be able to help people to tune in and find notes, learning to use their muscles and ears. As a choir we have grown in confidence and ability. We do learn tunes more quickly than in the early days, and so can work more on phrasing, dynamics and trickier arrangements. In rehearsals people get the experience of singing a line or word of their own, and move on in confidence: more members are now prepared to sing a solo part or in a smaller group at a concert or folk club who would have said ‘no way’ in the past. I wanted Morris to be open to people who weren’t that confident, who may not have used their voices for a long time, so there is no audition to join. I was certain from the start that I wanted such people to come and I would help them to learn how to sing. I encourage everyone to shake off the need for perfection and approval - if something does go wrong, we’re in it together! I always try to encourage people, and people encourage each other, and are not competitive in the slightest: the choir is a community. People come from all over London to Dalston for the Morris rehearsals. We have regular weekends away together, which wouldn’t work for every choir! Above all, I want Morris to be a choir that people enjoy being a part of. Each season we choose a theme (we've had birds, war, work, trains, death, drink, the sea, London...), everyone suggests songs, and I whittle it down from several hundred to fifteen or twenty. I try to find the songs that will work best for Morris, either in my arrangements or based on other people's. Our repertoire has always included traditional songs, new ones, ones we've found hidden in other genres, and ones from other cultures. We started the monthly Morris Folk Club as a way of sharing solo and group performances from within the choir, but it is also great for people who love to sing with us but can’t commit to weekly rehearsals. It was daunting to start with, but there were enough of us in the choir ready to perform that we could run a club even if no one else came! It seemed natural to teach a few communal songs, and that’s one of the club's distinctives; another, I think, is that there are usually more women than men in the audience and performing. We’ve performed at festivals and events organised by others, and at concerts we’ve organised ourselves; we've sung in stations, boats, museums, gardens, churches, halls and galleries; we've sung by ourselves, and alongside or behind others. In our performances we always engage the audience and get them to join in. We haven’t sought out high-profile opportunities, but some lovely things have come our way. Being part of the rehearsal process and performances of David Greig’s play The Events at The Young Vic was one kind of high point. Singing sea shanties at a South Bank poetry festival at the South Bank was amazing. And it was special to sing at Tim Jones and The Dark Lanterns' first album launch when Tim was in the choir (we lost him when he moved away, which is the main reason people leave the choir!). Our own concerts often come with a ceilidh, which is a great double bill! We’re thrilled that our 10th birthday concert and ceilidh is going to be at Cecil Sharp House. And for our tenth anniversary we decided to record a CD! After ten years, it was time to nail our colours to the mast! For the CD we chose songs I'd arranged and which spanned our history. Our live approach is always ‘joining in’ and informal, but a CD is different, and does need to be more polished. Recording it was a big, good jump in how we sing and work together. What does the future hold? Getting opportunities to perform as a choir, learning beautiful new repertoire, helping people to sing better, hearing people stand up and sing or play who might have been afraid to before - in choir and folk club, in new combinations of voices and instruments. More of the same, in other words! NB: Morris is not currently recruiting choir members, but would love to welcome you to the folk club on the last Tuesday of each month. 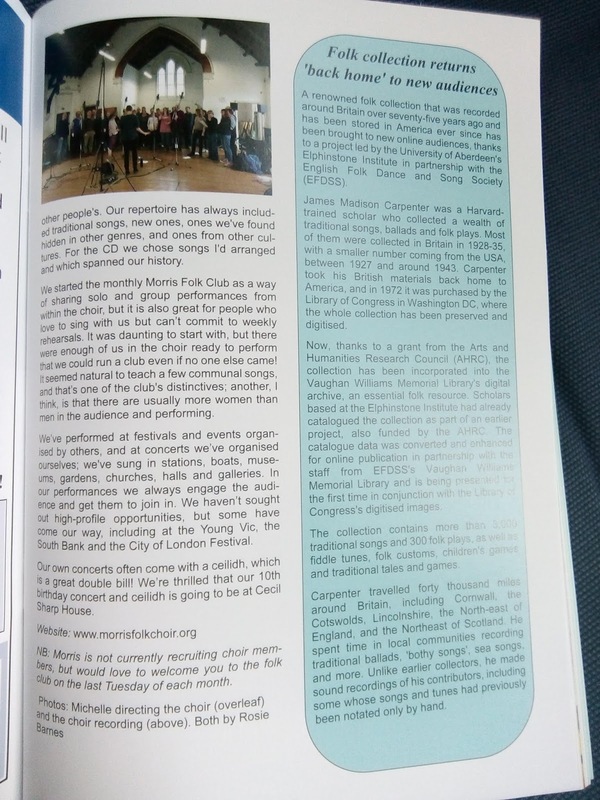 A shorter version of this article (written up from an interview with Michelle by choir member Iain MacDonald) first appeared in the June/July 2018 issue of Folk London. Our thanks to editor Peter Crabb-Wyke for publishing it, and for prompting us to write it in the first place!